Cover: Oh, MACH 1, your trips to America are proving quite eventful, aren’t they? First you save New York from a nuclear zeppelin, and now you’re somehow going to be involved in a situation where the Capitol building is teleported into the Atlantic? Oh, yes please. And, just a note here, I don’t care how surprising a place it is for a building to turn up, if your plane hits the building, it’s not attacking you. That’s like saying those planes were ‘attacked by’ the World Trade Center. A building is only ‘attacking you’ if someone physically picks it up and throws it at you. Now I’m thinking about Ninja Blade. Beautiful, beautiful Ninja Blade. It seems that the Volgs, acknowledging that they’re just not up to catching a lorry driver who hides on an island that’s basically in the middle (http://maps.google.ca/maps?q=isle%20of%20dogs&oe=utf-8&rls=org.mozilla:en-US:official&client=firefox-a&um=1&ie=UTF-8&sa=N&hl=en&tab=wl) of the city their occupation is based in, have resorted to offering a bounty on Bill Savage’s head. Along with two other resistance leaders we’ve never seen before. Apparently they work the midland. It’s nice that they show the conversion rate (and that deuts- sorry, VOLGSmarks are worth more than three times the british pound! ), but since this is the second time we’ve seen the suggestion of people being paid by the Volgans to kill or betray the resistance, it makes me wonder exactly what those traitors will be spending the money on. What’s the economy like under the Volgan invasion? Are businesses open again? Schools? Those aren’t the types of things that concern Bill Savage, of course. No, he’s more interested in teaching those dirty Volgs a lesson by ambushing one of their supply convoys! The Volgans are furious, but they’ve got an advantage Bill doesn’t know about. They’ve broken the resistance radio codes! And what’s the best way to exploit that? By letting it slip that an incredibly valuable convoy (anti-air weapons, high-ranking POWS) will be going through an area at a certain time, then listening in as the resistance plans their attack, then set up a reverse amush to slaughter them all! Yes, that would be a good plan. Which is why the Volgans, naturally, don’t think of it. No, they have a better plan… hire a private bounty hunter named Quarry to kill all three resistance leaders personally! How did these people ever conquer England in the first place? I’m amazed they were able to find England. With their operational track record it seems more likely they’d have wound up invading Baffin Island. Now I’m picturing this exact comic strip, except the main characters are all seals. Time to call Hollywood! Savage gets a radio call from the other resistance leaders. He’s to meet them alone at an inn out in the middle of nowhere. Natually, he goes. Arriving to find the other leaders already dead, Savage ducks out of the way just in time to dodge Quarry’s high-powered rifle round. That’s Quarry. I can only assume that travel restrictions have kept him from going on safari for a few months, and he’s become a traitor just so he’ll have something to hunt. Savage has a plan to get out of the cottage alive, though. He’ll set his shotgun on automatic (which, apparently, you can do) and have one of the corpses fire it out of the window by squeezing the trigger with his dead hand. I don’t know, doesn’t it seem like the recoil from the first shot would, at very least knock the corpse’s hand loose, if not throw him out of his chair entirely? The plan works, and Bill, knowing that his car has been destroyed, runs out the back of the cabin. You know, this is the part of the Volgs’ plan that really doesn’t make sense to me. How could things have possibly gone worse if there were an entire regiment of troops surrounding the building, as opposed to one deranged big-game hunter in a zebra-striped Land Rover? Quarry didn’t even think to bring a driver along, so he’s stuck firing a pistol with one hand while steering with the other. Not a great combination for accuracy, that. 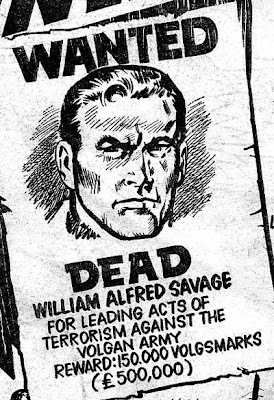 Seeing his salvation up ahead, Savage pulls his own wanted poster (which apparently he took from the cottage?) out of his pocket and throws it at the Land Rover. In what has to be the luckiest throw in the history of people throwing things, the single pieces of paper flattens out on the Land Rover’s windshield, exactly blocking Quarry’s line of sight. By the time he clears the poster away (with his hand – apaprently he’s too tough to just use the wipers) Quarry discovers that it’s too late – he’s been murdered… by irony! 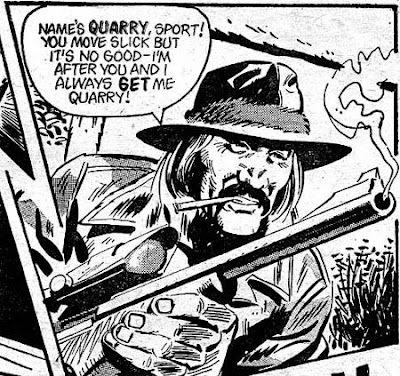 Ah, Quarry. 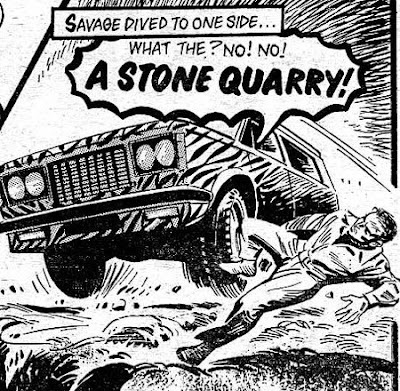 He forgot one key thing – the word Quarry has two completely different definitions, and that’s the kind thing that writers can’t resist exploiting! It’s just sad that he realized only too late that he was the villain in a poorly-written action strip. Also starring in that strip are the Volgan high command, who receive a letter from Bill the next day, mocking them for their inability to kill him. Of course, they deserve to be mocked this time around. Would it have killed them to send along a little backup with Quarry? Or just put a bomb in there or something. Do you even want to win the Invasion, guys? It’s the apocalypse at the Trans-Time base! Raptors are running everywhere, eating boxes of packaged meat, spiders are pouncing on anything that moves, and Old One-Eye is focused on tracking down that one human she’s pissed at. Not that this stops her from killing every other available human in her path, of course. Hell, even the poison spiders crawling all over her can’t stop the old hag! She doesn’t have to wait long for the confrontation, as Earl leaps onto her head, attempting to stab her in the brain with the electric prod he’s used to put her eye out nearly two weeks previously. One-Eye’s too fast for him though, and with a shift of her head, Earl winds up falling into her mouth. 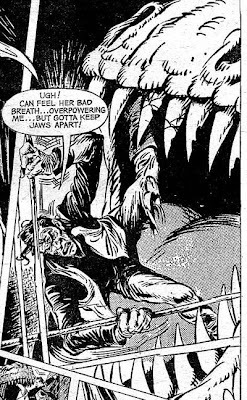 Things look bad for our ‘hero’, but he’s saved by the writer’s woefull misunderstanding of the relative strength of a dinosaur’s jaw muscles as compared to a human’s legs. Proving that there’s no situation so bad that it can’t get worse, the Flesh Controller picks just that moment to grab One-Eye with his fleshdozer, hoping to drop her and Reagan into the grinders at the same time! It doesn’t go quite as planned, though – Reagan falls through the hole in the floor into the spider pit, where he gets bitten! And One-Eye proves too heavy for the Dozer! One-Eye tears the cockpit open and devours the FC! It looks like… the dinosaurs have won! And the comic’s copy editors weren’t doing there job! 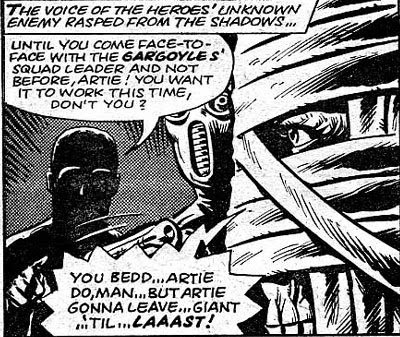 It’s time for a third-round match for the Harlem Heroes, this time they’ll be playing Gorgon’s Gargoyles, a team of bizarre monsters! Seeing their horrific faces, Slim remarks that they can’t possibly be human – Giant reveals that they aren’t! Apparently since that summer special it’s become commonplace for fake people to play the sport. As a result, an entire team of ‘android robots’ assembled by ‘computronic surgeons’ has made it this far into the world championships! Amazingly, this leads to us finally getting a new Aeroball Rule: “59 - Computronic players must reduce their energy output to human levels during the game.” Of course, ‘human levels’ is an incredibly vague term with no clear meaning. Do they have to be an average polayer, or can they all have the output of exceptional players? To use Heroes terms, could they each be as nimble as a Hero and as tough as a Flying Scotsman? 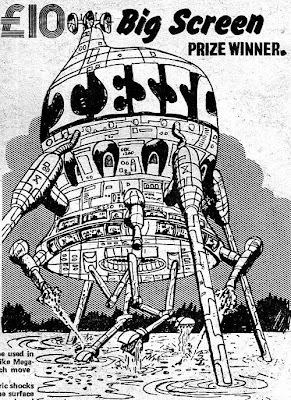 And, power level reduction or not, isn’t the fact that the robots are made of metal and plastic going to make them supernaturally resistant to the kung-fu that human players use on them? Or is there a separate rule about how they have to fake being injured? While the rest of the team practices for the game, Giant and King have a conversation where the old-timer mentions that the rest of the team seems to be playing like they haven’t got a care in the world. Giant explains that he’s trying to keep the whole ‘someone is trying to kill them’ thing on the Q.T. for the time being. Which seems like an incredibly dangerous thing to do – don’t the players have the right to know that, in addition to the dangers of Aeroball, some madman is out there trying to kill them? Also, didn’t they think something was up when that guy shot at them with a rifle and then crippled Sammy? I’d like to have been there for the bus ride home afterwards, when the other players tried to ask about the gun-toting killer cyborg and Giant explained that it wasn’t anything worth worrying about. Speaking of that cyborg, in the next scene Artie is back in his doctor’s office, this time getting a new face! But whyever would he be doing that? Oh, they tell us right away, after Artie asks when he can take the bandages off. Way to kill the mystery, there, Ulysses Cord. Whose glasses those clearly are. There’s only one character in this strip who wears glasses, and look, there they are. Then it’s on to a confusing introduction of the Gargoyles, at their own stadium. Yeah, I’m not really sure what those fans mean. They ‘refused’ to wear nu-faces? Aren’t they robots? How much choice do they have in the matter? More to the point, it’s not like those monster faces just kind of happened. These guys were BUILT to look like that, weren’t they? So they could be a monster-themed aeroball team? If that’s not what the story is trying to get across, I’m going to be even more confused than I already am. Missing from that group is ‘Joe Mugglie’, the Gargoyles’ captain, who’s still lounging in his apartment, which apparently robots are given, rather than just storing them in a box somewhere. There’s knock on his door, and he’s surprised by a bandage-wearing man, who reveals himself to be… Joe’s Evil Twin! Not exactly Witness Protection Program level alteration, is it? Artie quickly destroys Joe and then heads over to the stadium, where he finds his ‘team’ waiting to help him take on the Heroes. But little do they know that he’s going to make sure this is the last game the Heroes ever play! 16 - Only a Squad Leader can call time out, and only if two or more players are sidelined by injury. 28 – Don't touch the score posts. 59 - Computronic players must reduce their energy output to human levels during the game.
? - Don't kick (or punch?) people in the back of the head. Captured by the Mekon, Dan, Rok, and Cap are taken back to their secret base – which it turns out is inside the planet, which is actually hollow, and gets light and heat from a floating magnetic core in the middle! There’s a twist! I assume I don’t have to explain why that’s the second best thing ever, right? Dan refuses to be seated in the chair, going so far as to grab one of the gun-headed guys by the barrel and swinging him around like a club. It’s all for naught, though, as he’s captured by the Two of Verath and forced into the chair, where the blob slithers all over him. Its power? To find out things from your mind and make them play on its skin like a movie screen! Which is actually a little scary. Watching the screen the Mekon discovers that Dan actually is his arch-Nemesis Dan Dare, after cryonic storage and reconstructive surgery. 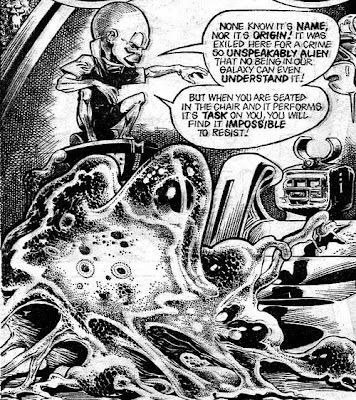 The Mekon immediately plans to kill Dan in the most horrible way he can devise – by sealing him in a glass ball with carnivorous worms that keep their victims alive for years while slowly devouring them! This comes from a Steven Abrahart of New Malden. He was inspired by the fleshdozers of ‘FLESH’ to create the ‘fishdozer’, which works by walking through the oceans on extendo-legs, shocking fish to death with lasers, then scooping them up and proccessing them inside to be shipped out to ‘hyper-markets’. Which will seemingly all be TESCOs. And what year is this amazing future supposed to take place? 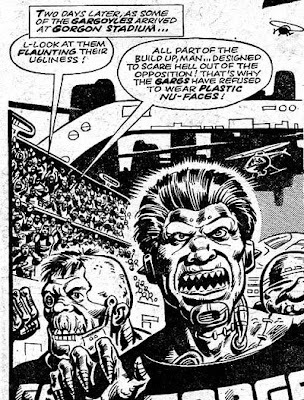 Oh, and proving that the editors of 2000AD were still trying to figure out exactly what the nature of the comic was, when another writer suggested that instead of six 5-page stories there be three 10 page stories each week. ‘Tharg’ responds that if enough fans write letteesr in agreement, that’s something that could easily happen. Oh my god I was completely wrong. 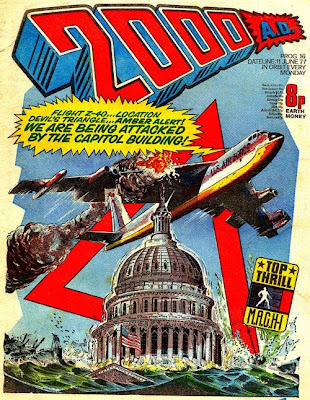 It seems that the cover was misleading – the Capitol Building actually was attacking John Probe’s blackbird fighter! Except it’s not the Capitol at all… it’s a secret base with electromagnetic guns that scramble Probe’s computer and hover salvage-ships that rescue him from the water when the plane crashes. Who is responsible for all this? That’s right. His name is Adolf, he said ‘and (they) called me crazy!’, and he built a submergable base that looks like the Capitol building to mock the Americans. All in a single panel. Wow. When Probe wakes he finds himself tied to a table. Adolf is planning to dissect him to find out the secret of the Compupuncture Hyperpower! Probe decides he’s not going to sit around waiting for that, and breaks out of his restraints! Running down a hallway to where he assumes Adolf must be (despite having no idea where he is or what the building’s layout is), Probe finds himself chased by a heat-seeking mini-missile! Using his super-speed Probe tricks the missile into hitting a steel door. Wait, didn’t he do that exact thing in a plane a couple of weeks ago? In another amazing coincidence, it turns out that random door was the one that led to Adolf’s office. Adolf gives Probe the standard option – work for him or die! Probe comes up with a thrid option, grabbing a mirror and using it to reflect Adolf’s electron ray! 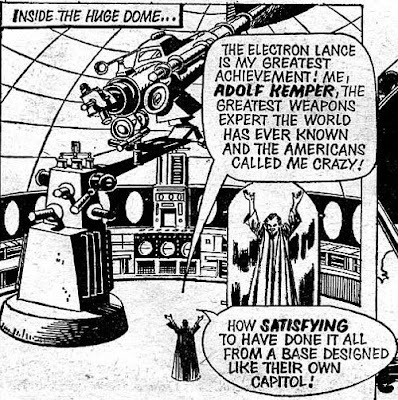 With Adolf dead, all that’s left is for Probe to kill all of the henchmen, who he calls ‘Slant-Eyed Vipers’ by lowering the Capitol even further until the pressure crushes them, while he’s able to swim to safety! It’s funny, I didn’t even realize the henchmen were supposed to be Asian. Nope, still can’t see it. It’s showdown time here in Mega-City 1. 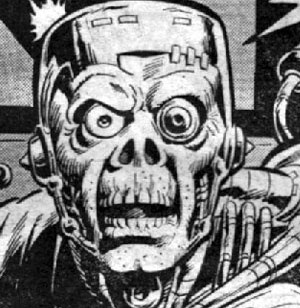 With the robot factory shut down, all that’s left to deal with are Call-Me-Kenneth and the Heavy Metal Kids he’s brought with him to attack the hall of justice! With no hope of winning in a frontal attack, Dredd and his loyal robot sidekicks Walter, J/70 and Howard the maintenance robot, take a jet up to weather control. Their plan? To create a deadly localized electrical storm that will short-circuit all the killer robots! One problem: Creating electrical storms over Mega-City 1 has been illegal since 2012! Hmm. I’d think the bigger problem would be using the weather control system to create an electrical storm at all. When you’re building a whether control system, is that a setting you should really put in there? More importantly, how was there a time between the technology being invented and electrical storms being declared illegal? This seems like an incredibly egregious example of the law following technology. After running the circuits through Walter to facilitate a short-circuit, Dredd starts the electrical storm, giving Mega-City 1 the first lighting it’s seen in 87 years! The lightning strikes the Heavy Metal Kids, driving them insane, then shutting them down… but not before they hammer Ken pretty badly! By the time Dredd arrives at the Grand Hall of Justice the war is over. The last of the rebel robots are being rounded up. There’s only one piece of hanging thread left over. Ken’s body is nowhere to found! 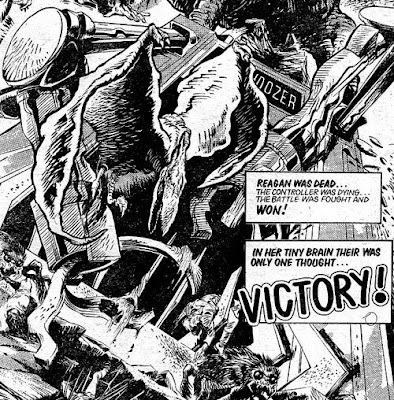 Best Story: Dan Dare – It was a close one this week, with MACH 1 putting in an amazingly crazy showing, but that blob was just too wonderful to overlook. Worst Story: Invasion – Stupid premise, lame execution. Even the jaw-dropping ‘ironic’ fate of the villain couldn’t save this with its absurdity.